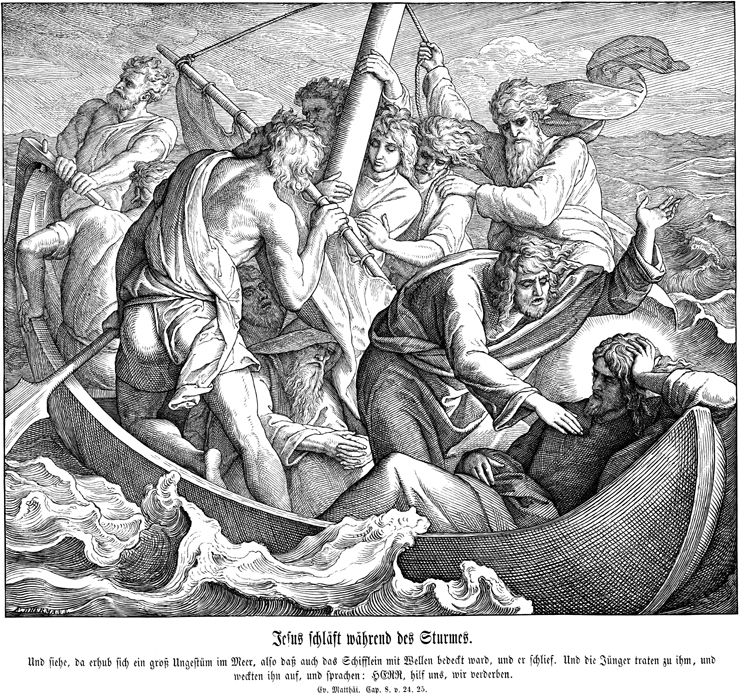 Jesus asleep during the Storm; Julius Schnorr von CAROLSFELD; 1851 engraving from “Bibel in Bildern”. A fishing-boat in the storm. The Lake is turned into a rough sea, the wind blows, the waves are high… The crew lower the sails and are frightened but, while they are busy, a man is asleep in a corner of the boat; he is not troubled but somebody comes to wake him up. The view from above gives the drama more power and allows the spectator to see the contrast between the frightened fishermen and the calm of sleeping Jesus. On one side of the boat, Jesus is asleep, on the other side, he is standing and commands the winds to calm down. The storm and the winds sometimes take the forms of demons blowing and rousing the elements. Quite a number of narratives in the Gospel take place on Lake Tiberias, a real interior sea with its storms, its boats and its fishermen, among them several apostles, Simon Peter in particular. All these representations have in common a boat on the lake. The Miraculous Draught of Fishes; Gustave DORÉ; 1865; engraving from the “Holy Bible”. of fishes does not take place in a storm but the boat is so heavily loaded with fish that it can be mistaken. Wanting to imitate Jesus who is calling him, Peter tries to walk on the water, but sinks and holds out his hand towards Christ who rescues him. The boat is full of fish but this is another subject. Jesus gets into a boat with his disciples. A sign of salvation for his disciples, the calming of the storm is also a sign of the power God gives to Jesus. on one side of the boat, Jesus is asleep, on the other he is standing and commands the winds to calm down. The storm and the winds sometimes take the forms of demons blowing and rousing the elements; or it is the boat that becomes demoniac. 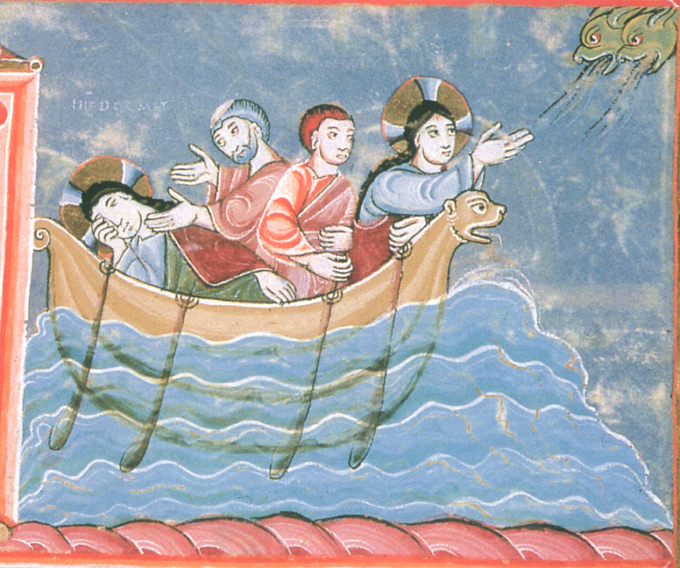 Jesus stills the Storm; miniature of the gospel-book of Echternach; 11th century; Nurember, Germany. The view from above gives the drama more power and allows the spectator to see the contrast between the frightened fishermen and the calm of Jesus who is asleep or who has just been woken up and who gets ready to act. Christ on the Lake of Genesareth; DELACROIX; oil on canvas; Metropolitan Museum of Art, New York. 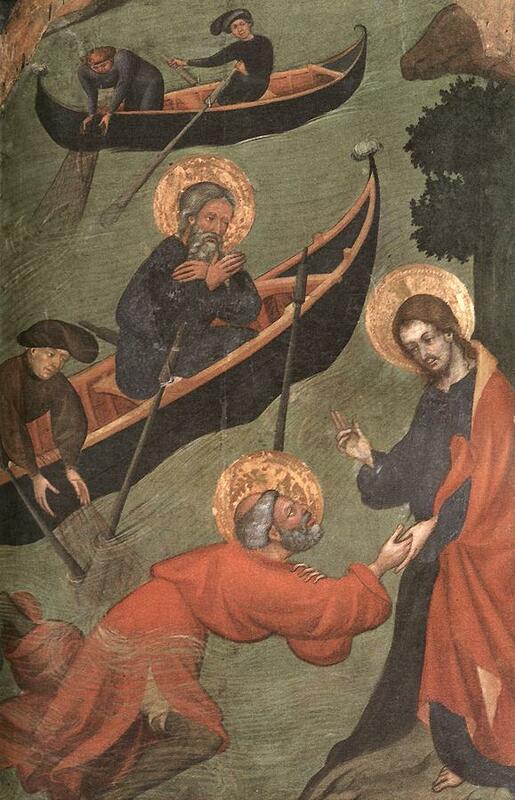 The storm is often made visible by its effects: the men have lost all control of their boat whose sails have been torn, its mast broken…Jesus becomes the man of storms, standing before the elements.